Or view larger version. Migrant Mother. 1936. Dorothea Lange. Gelatin silver print. Collection of Oakland Museum of California. Gift of Paul S. Taylor. 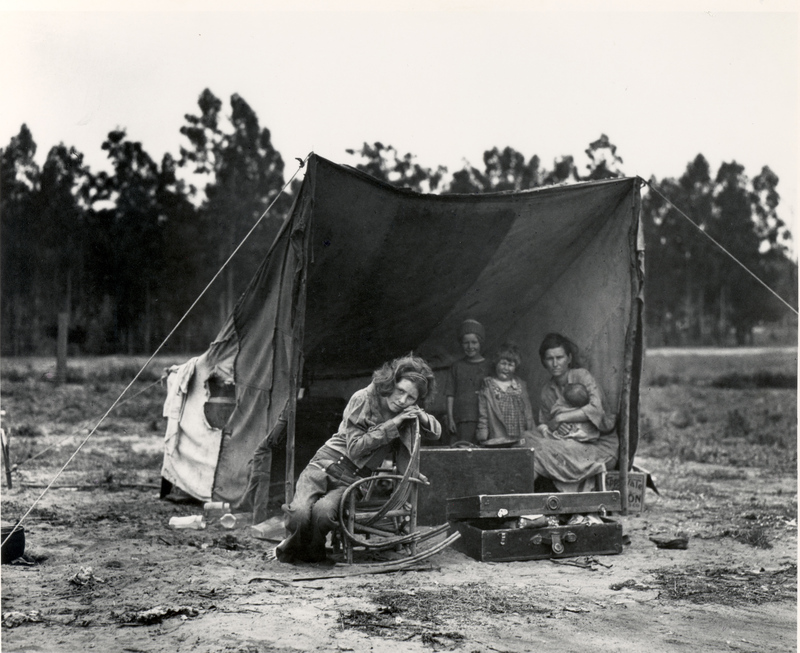 This photograph shows a Depression Era mother sitting inside a makeshift tent with her children. The federal government discontinued cash aid to transitory individuals in 1935, which worried Californians about the wave of impoverished migrants. In 1936 the city of Los Angeles enforced a “bum blockade,” to keep those deemed unable to support themselves out of California. In 1939 police in the Central Valley arrested migrants under a law that made it a crime to knowingly bring an indigent person into the state.